Rational isn’t word familiar to this blog. I’m a very deep thinker. I had to share this with my coworkers. One fresh bowl of Love, lol. Who doesn’t like soup made with Love? Just keep the bayonet away from my deck. Are we playing some weird form of online Marco Polo? I’m so happy you think I have deep thoughts. Just like the opposite of love is not hate but avoid. I think with human beings, the tendency of intermixing concepts is viable. Can’t help it 🙂 Well, this is brilliant. Thanks sharing! 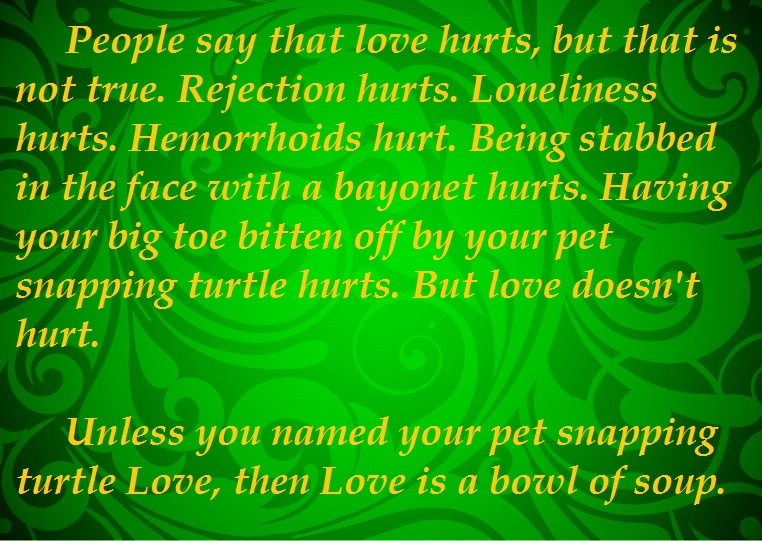 The point to remember: Love is a bowl of soup. This is the most inspirational thing I’ve ever read. It made me sob like a child and I’m sure a little pee leaked out as well. Crying pee is the purist kind. If I can make just one person cry-pee (or pee-cry) then I have done my job. It’s hard for me to comment through all the tears. Then I have done my job well. So much truth. Thanks for this! Spreading the truth is a duty. That is almost certainly what it’s called. I thought so!! (Dang turtles)! You would turn your own toe into soup, when your turtle bit it off and digested it? If a human eats a human, it is called cannibalism, what do we call a human who eats a pet that has eaten a human??? Oh wow, I think I’m going to have you write inspirational quotes for my book chapters. Then again, I don’t suppose I could afford talent like that! This level of gut wrenching soul searching comes with a price. My only goal is to inspire. The emotion. The feeling. The thought-provoking prose. Brilliant, Lar. Frakking brilliant, bro. great line by you . Not a line, just pure truth. wow . what type of poetry you like to write ? Mostly limericks about a weird man who lives on small island off the coast of Massachusetts.